Now that summer is officially here, I am excited to share some ice cream and sorbet recipes that I’ve been preparing since last month. I hope you are all as excited as I am to make ice cream and sorbet! After debating for a month or so last year, I finally purchased an ice cream maker toward the end of summer 2011. I think it was one of the best investment among all the kitchen gadgets we’ve purchased! I definitely have quite a few gadgets sitting there collecting dust, but not my ice cream maker. Last summer I’ve made Mango Ice Cream, Lychee Coconut Ice Cream, Red Bean Ice Cream, and Green Tea Ice Cream. 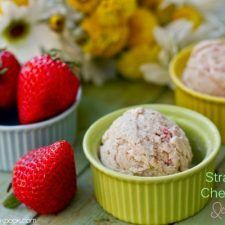 When I saw Simply Reem’s Strawberry Cheesecake Ice Cream recipe, I knew this would be the first ice cream recipe that I wanted to try this summer. I used to share a bowl of this ice cream at Cold Stone when I was dating with my husband, then boyfriend. Now we have 2 children who enjoy this ice cream as much as we do. This week is the last week for school for my son. I can’t believe he’s already done with Kindergarten! Are your children out of school yet? My daughter’s preschool is all year around so I get to spend solo time with my son when he’s not in summer camps. Any plan for you this summer? Have a wonderful week and have fun making homemade ice cream this summer! Homemade strawberry cheesecake ice cream with bits of honey graham cracker and fresh strawberries, each bite is heavenly! 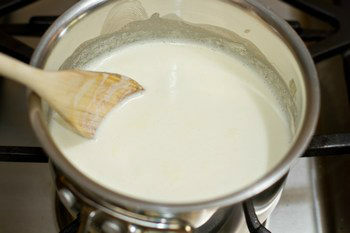 In a small saucepan bring the half-and-half and heavy whipping cream to a scalding point on medium low heat. “Scalding” means gently heating without allowing to reach boiling point. Immediately remove from heat. In a bowl (or stand mixer), whisk cream cheese, egg yolks and sugar till they turn light in color and fluffy. Once the egg yolks mixture is done, gradually pour and mix the scalding half-and-half & heavy whipping cream mixture in batches. Keep whisking constantly to avoid the eggs from curdling. Now place the bowl over a saucepan of simmering water, keep stirring continuously with a spoon until it starts to thicken up. Once the consistency is thick enough to coat the back of the spoon, the custard is ready. Immediately remove the bowl from the heat and stir it for few minutes to help it to cool down a bit. Meanwhile, make strawberry puree, chop up strawberries, and crush the honey graham crackers. Now add the vanilla essence and strawberry puree and stir well one last time. Cover the custard and let it chill in the refrigerator for few hours before making the ice cream. Once you're ready to make the ice cream, transfer the chilled custard to the chilled container of your ice cream machine and process according to the manufacture's instruction. During the last 5 minutes of ice cream churning in the machine, add the chopped strawberries and graham crackers. 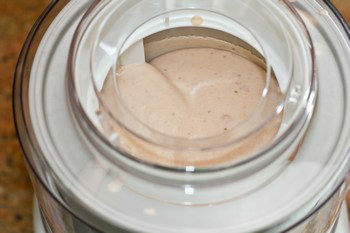 Transfer the ice cream to a container and let it sit in the freezer to set, about 3-4 hours. Serve Chilled. Half & Half: This is an American product which is a mixture of one part milk to one part cream. 1 cup of Half & Half = 1/2 cup milk + 1/2 cup heavy cream. Ice cream maker: If you don't have an ice cream maker, check out here. Simply sensational!!!! I’m in love with your ice cream, Nami…..I need an ice cream maker. Which one do you have? Your ice cream seems so divine Nami! I love the combination of your flavours! And I love your photo too. It seems like an ad. I just took out mine from the shelf. I had been meaning to make some this weekend but I wasn’t able to. Hopefully today. Oh..this looks so yummity-yum, Nami..love the click with stacked Ramekins! I need to get better at using my ice cream maker. This flavor is definitely something I would like and I love your colorful bowls. Aww I am glad you liked it…. Thanks for trying it sweetie. Yum, I adore cookie pieces in ice cream and the addition of strawberry puree makes it that much more delightful. If it wasn’t freezing cold here, I’d whip up my ice cream maker and make some pronto! But it is so it will have to wait. 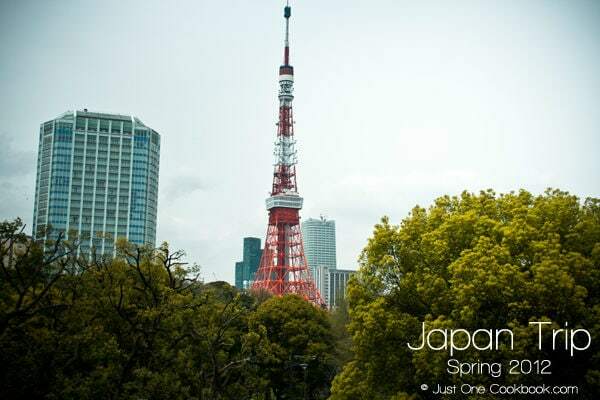 I like the ramekin tower photo! love the pic with all the bowls – brilliant. Such a summery dish, and we’re shivering here in London with torrential rain, on our special Jubilee weekend…! oh well, I’ll dream of this divine recipe in the meantime. This sounds delicious. I love making ice cream, but have never thought of a cheesecake flavour. Will have to try this soon, thanks. OK, this looks amazing Nami. Last year I felt that I just had to have an ice cream maker so I bought one. I’ve used it twice, shame on me. Your recipe and pictures are making me want to bring it back into service. Last week of school already. Lucky things – we don’t finish until 5 July in France! But compensation can be given with this ice cream, Nami. Ideal for making macarons with the whites that are left 😉 This looks so fabulously creamy. Beautiful floral shots too! What a beautiful looking and sounding ice cream Nami! We are in winter at the moment so I won’t be making ice cream any time soon. I meant to say how I love the colour of your ramekins – gorgeous! Oh this looks amazing. I bet your kids loved it. Wow, I can’t wait to try this! Lovely, Nami! Häagen-Dazs sells this flavour too & it’s one of my favourites. So cool to have an ice-cream maker, like 玩具. Hahaha! I wanna try your Lychee Coconut Ice Cream!! Wanna be my neighbour?? I am definitely going to have to make this soon! Sounds amazing! I need to give my ice cream maker a try again. I was so unsuccessful using it last year. Your ice cream looks absolutely beautiful, rich, creamy and gourmet!! Well done!! This sounds and looks amazing. Time to pull out the ice cream maker! Hi Nami! I love your choice in ice cream;-) It is time to get out the ice cream maker, you’ve inspired me with your strawberry cheesecake ice cream. 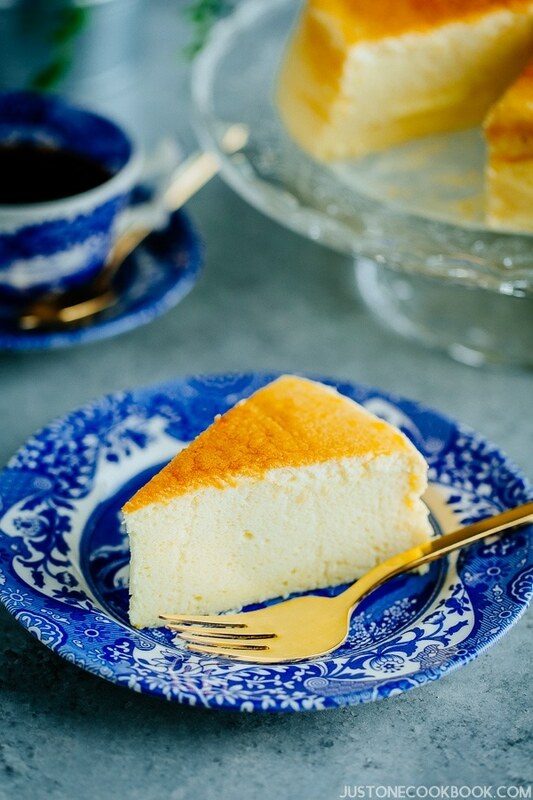 Beautiful post with lovely photos, I’m sure your family goes crazy for this recipe! I love making ice cream – this flavor sounds delicious! Love that you make this for your kids now, that you used to share with your husband! Yay, another ice cream recipe! And how did you know that strawberry cheesecake was my absolute favorite flavor? We are offically in winter, everything is gray here and the humidity is very high, but no matter how the weather is, we always can enjoy an icecream. We have a different school period here, because we have different weather than you, so our children start school period on March and finish on Decemeber. Simply delicious! it is time to make ice creams. Lovely flavors. Your ice cream is so pretty, Nami! I *love* Strawberry Cheesecake and I love your pastel ramekins. Can’t wait to try this! My daughter gave me an ice cream maker last year and I have to admit it didn’t get used nearly enough. That will change this summer, I promise 🙂 Strawberry cheesecake sounds divine and it looks beautiful in your pastel bowls. Happy Summer, Nami! I know I’m more excited about summer’s arrival than I’ve been in a long time. Nami this looks SO good! I just got the most beautiful strawberries this weekend and I was looking for strawberry recipes. Jackpot! My son has finals this week and then summer will officially begin for us on Friday. I’m going to save this one for sure! Your ice cream looks delicious! I love the green tea flavored one very much. I must persuade someone to buy me an ice-cream maker too lol! Nami, you have combined two of my all time favorites in this dessert: ice cream and cheesecake!! 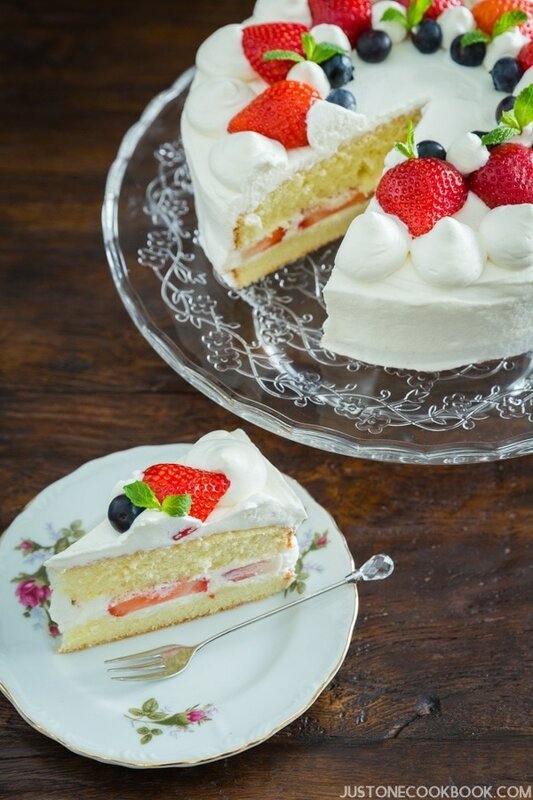 And all those strawberries make it a perfect summery treat! Hello my sweet friend Nami! I’ve been away on short vacations but now I’m back..
I’ve been thinking about this ice cream machine for a while now.. I have to purchase one after all..
Have a nice week my friend! I love the picture with the different colored stacked ramekins. =) I’m not a cheesecake person, but the ice cream sure looks yummy. Oh yes – I want this in my life. The minute the local strwberries appear on the stands, I am making this. Nami, every time I pass by ice cream makers in the store, I think of your ice cream recipes! This one looks yummy also, too bad I don’t see myself buying a machine anytime soon, the temptation to eat the whole container will be too great! On a side note, I bought some palm sugar yesterday at the Asian market, can’t wait to try them out! I have fond memories of this ice cream flavor too — I used to get the Ben & Jerry’s variety when I was in college. This looks even better! Love all the cute ramekins too. Oh goodness, my husband will adore this, Nami! Ice cream and cheesecake are his favorite desserts!! I’ve had ice cream on my mind, too. I’ve been making sorbets but I think I need to switch gears a little. Strawberry cheesecake sounds soooo good! I think I’ll be pulling out my ice cream maker again this week! What a terrific idea for summer strawberries! I can’t wait to try this. Ice cream is always the best for dessert any time! Thanks for this recipe, Nami! I love homemade ice cream! And don’t make it enough. When I lived in Florida, I got lazy – the big Florida supermarket (Publix) had great store-brand ice cream, so it was too easy to buy it and not make it. Now that I’m in St. Louis? Pffft. Anyway, there are high quality strawberries everywhere right now, so what perfect timing for this. Nice recipe – thanks. Now I’m really crying because I don’t have an ice cream maker…sob, sob! If I had one, this would be the first thing I make! I have a commercial ice cream here in Canada that I like: President’s Choice’s Strawberry Shortcake…and it has pound cake chunks in it! yum!!!! But of course, nothing beats homemade! Yours is just spectacular! This makes me SO happy I have an ice cream maker now. I promised my husband I would make chocolate next, but this will be made right after! Mmmhhh, divine! I have an ice cream maker, but I don’t like it so I use my KA (flat beater). Im instantly smitten with this one! 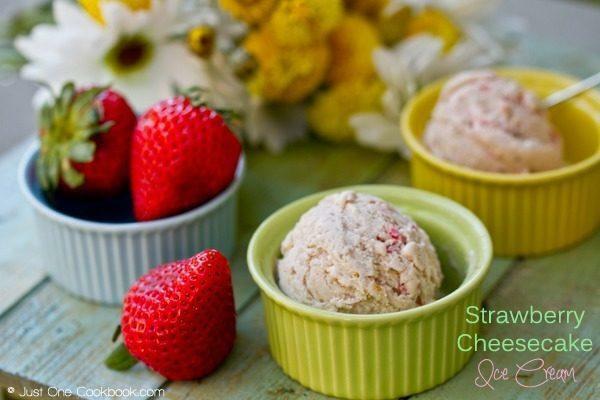 Strawberries and cheesecake in ice cream form?!? Uh… Yes!! There is ice cream everywhere these days lol. I love your flavor and wish I had a bowl now. Just finished lunch and I have no dessert. Yeah my ice cream machine is well used too. Can’t wait to see your next recipes. Thank you for sharing such a yummy recipe! And for the links to some older recipes, too! We just got some mangoes from a neighbor and mango ice cream sounds so summery! One question: Is “vanilla essence” different from “vanilla extract”? Thanks, Nami! When I opened my email this morning and this I almost jumped through the computer! Nami, you cannot imagine what tortures I endure seeing such gorgeous ice-cream! 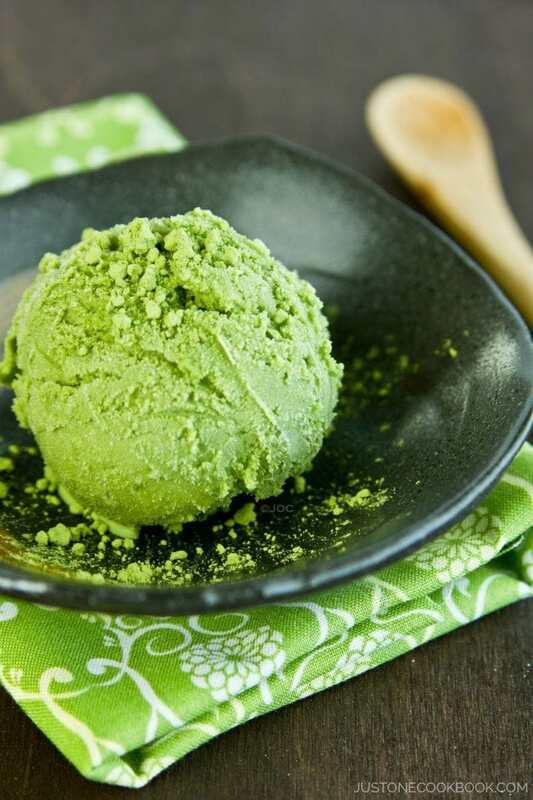 I still haven’t bought an ice-cream maker (not to mention a bigger freezer) and yet I decided to do it last year seeing your gorgeous matcha ice-cream… These look fabulous too and the graham crackers must make them exceptional with a crunchy twist. I love the way you presented them on several stacked different coloured ramekins. You are so creative and such an excellent photographer! I feel like I just need to get an ice cream maker now!! Looks absolutely yummy! I love strawberry, how could I resist this? I have my own ice cream recipe I hope to have up on the website in a few weeks. This looks good in the meantime! A dessert recipe! YAY! My aunt gave me an ice cream machine last year and I swear this summer, I will be making new flavor each week!!! This sounds creamy and rich and perfect to beat the summer heat! Yummy! Pity that here is really starting to be cold and I feel more like hot chocolate… but still, as a dessert ice cream is good in all seasons, and Sunday was warm enough to get a scoop in the afternoon! The only thing for me is to remember to put the ice-cream bucket in the freezer! Ice cream can’t get much better than this! Now I need to go back and look at your ice creams from last summer! But then that might make it very hard to choose! What a yummy looking treat for this hot weather! This looks so delicious! I cannot wait to get back home so I can make this wonderful treat for my family. Your photographs as usual are stunning! i have that same ice cream maker= does that mean my ice cream will turn out the same way? LOL! You are a super genius girl! I am in love with this ice cream. sorry i was mia last week. SOOOO busy but I am back now! Looking forward to your recipes. I think I’m feeling sappy tonight, I totally got teary eyed when you said your son is done with Kindergarten. I remember that time as well. Now mine is done with 2nd grade!!!! It goes entirely too fast if you ask me. 🙂 One more day to go for us then it’s time for summer fun. Our camps don’t kick in until July, so the next few weeks will be fun/interesting. 🙂 This ice cream looks phenomenal. Ice cream, strawberries and cheesecake all in one. Yum! Nami, what gorgeous ice cream! Perfect for summer, and the texture looks great. That looks wicked good. I’ve been holding out on getting an ice cream maker only because I’m afraid what it will do to my hips. LOL Having the ability to make ice cream all the time may be too much temptation for me to resist. I wish I could have that scoop right now! It looks and sounds so yummy, Nami! It’s actually cold here, but I just can’t resist icecream in cold weather =P haha. We’ve been stearing clear of ice-cream in Sydney as its been so cold but I’d def make an exception for this 😉 Looks amazing Nami! So delicious!! Good day to you! Thank you lots and lots for this ice cream post. I loves everything with strawberry and this ice cream sure must be a yummy dessert. Of course I will try to make it at my soonest as the weather here in Msia is very hot nowadays. Looks awesome. I have cream cheese and strawberries in the fridge and my ice cream bowl in the freezer. I think this ice cream is meant to be! I love Reem’s blog and I can totally see why you made this! I am going to have to try this one out too. And I love your photos, they are so fun and playful! Oh I could use a few scoops of these decadent ice cream! It’s so hot and humid here! I saw these colourful ramekins a few months ago at a 100yen store, bought some white ones and I broke one. Went back last weekend but they don’t sell it anymore (sob sob). We have debates at home to buy an ice cream maker or not-)) To me it seems like very good idea, my husband thinks that it is going to collect dust-)) After reading your post, I think I am ready. Thank you! i love making ice cream! this sounds absolutely delicious! 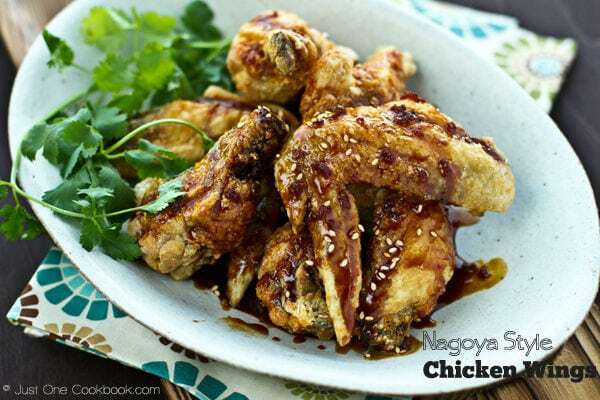 Thanks for sharing this recipe and hope you are having a fabulous week Nami! Nami, wonderful and delicious specially for summer. Love the idea!!! ARe you in my head? All I’ve been craving recently is ice-cream!!! Aaah this sounds fabulous! I have made quite a few mainly frozen yogurt recipes last year. I keep borrowing the ice cream maker from my in-laws. And I agree, it is one of the best kitchen gadgets ever… But I haven’t tried any cheesecake ice cream yet. It looks delicious! Your presentation is beautiful as usual!!! This ice cream looks so creamy and delicious! I love your colored ramekins too. So cute! It looks so divine! Thanks for sharing this culinary jewel with us…The photos are gorgeous too. You mentioned once that food styling has been a challenge for you. Really? I think you are doing like a pro. You got talent! I pretend to overlook ice cream makers while I shop – just because once I buy it there would be no stopping! Guess out of sight ..out of mind works best sometimes! I too adore making ice cream – not sure why I don’t do more during the fall and winter months. This strawberry cheesecake ice cream is simply making my mouth water right now. Love the photo of the stacked colored bowls – great shot! Pinning now to make later! Congratulations on the purchase of your ice cream maker! I was so happy when I purchased mine and haven’t looked back as it’s just so easy to make your own and tastes so much better than store bought. I’m just wishing it wasn’t winter here now as I’d love to try some of your gorgeous ice cream! Delightful combination! I love your cups in stacks…Lovely colors! Pretty pictures! This ice cream looks amazing. Strawberry cheesecake is such a perfect flavor. I dont have an ice cream maker here but have been successful in making creamy ice cream without one! I cannot wait to try this one next! I love strawberry cheesecake Ice Cream. The recipe I make uses no eggs. I can imagine how creamy and delicious this must have been! Great clicks, Nami. Your ice cream looks amazing and I love how you presented it in stacks of colorful container – brilliant! I finally bought my ice cream maker too last month and I can’t wait to try some of your recipes. O.M.G….that’s all I have to say about this ice cream!! Wow! I love how delicious this ice cream looks! I’ll definitely try this…but maybe without the eggs. Thanks for sharing this, Nami! Enjoy the summer! Oh this ice cream is really making me want to buy an ice cream maker. I keep putting it off, not wanting another gadget to have to move around. Ice cream just doesn’t work out without one. Nami, this looks delicious. This recipe looks fantastic! Perfect for summer. I am actually hosting a strawberry linky party at http://www.2sisters2cities.com/2012/06/fresh-produce-tuesday-week-11-strawberry-recipes/ as part of our Fresh Produce Tuesday series. I would love if you submitted this recipe! Nami I love Ice cream and this look georgeous!! I hope to make soon! Sensational combination! I love the creamy tart flavor of cream cheese in ice cream. I’m with you there. I didn’t get my ice cream maker until Memorial Day weekend of 2011. I’m churning some olive oil ice cream as I type! I don’t own an ice cream machine but you make me want to go straight out to get one!! Looks so refreshing and i love how your styling! OMG this sounds so good and looks smooth and delicious. I love making ice cream as well and when my kids were home – now done with college and gone – I’d make ice cream all the time. This recipe is definitely a keeper. My entire family would love it! Nami, you are tempting me to get an ice cream maker soon. With all year round hot weather here, i think it is worth to buy one. Ya, I also want to get few colours ramekins like you from Daiso. I must try this lovely recipe once I got my ice cream maker. Perfect for the hot season here….love the way you made it….awesome color and drooling pictures…. I never knew a cheesecake can be an ice-cream at the same time! I love those crunchy cones. Nami-saaaaaan….because of you (and your ice cream), now I`m dying to get an ice cream maker! 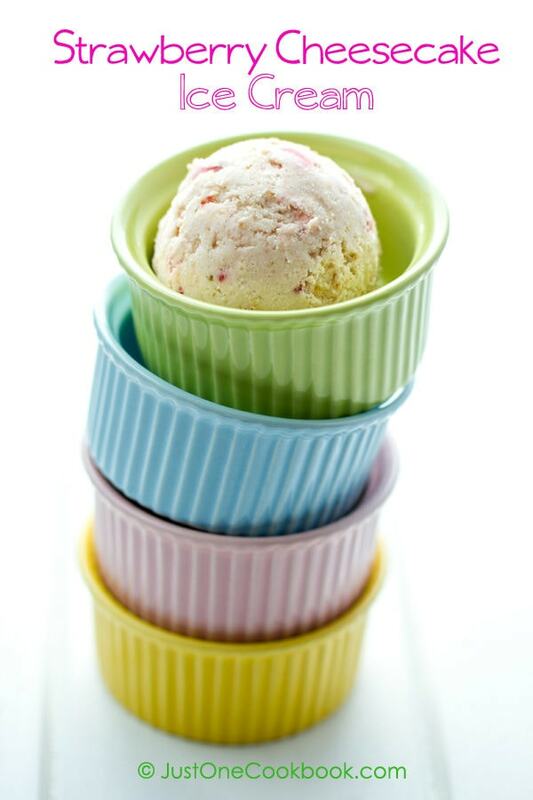 The picture of ice cream and the stack of colorful ramekins really caught my eyes and heart instantly! Ooo yum! I had strawberry cheesecake ice-cream almost every day after dinner my freshman year in college. We had one of those big self serve machines and I was absolutely addicted! Yours look awesome! So super creamy, I’m totally craving some of this right now! Wow, this looks so good! Gorgeous & delicious! Hi Susan! Half and Half is a mixture of one part milk to one part cream. According to Wiki, In Canada and the United States, half and half (known as “half cream” in the United Kingdom) almost always refers to a very light cream typically used in coffee. The name refers to the liquid’s content of half milk and half cream even though its butterfat content is only about 12.5%. I LOVE ice cream. You don’t even know how much! I’ve made my own strawberry cheesecake ice cream before. It was so rich, creamy and oh-so-delicious! Nami – this looks delicious! You’re photography is awesome! I’ve been neglecting my ice cream maker for 2 years. I think I’m going to get it out and make some pure vanilla bean ice cream this week. This looks so good…!!! I wish I was your neighbour, Nami…!! I bought an ice cream maker in the spring and have yet to take it out of the box. Not sure why I haven’t made any yet – but this recipe is going to break that box open as soon as I get a little bit of time in the kitchen again 😀 I can’t wait!!! hi, your recipe looks very good! but can i get the measurement in grams? hi , nami . thanks for sharing the recipe . BTW , may i know where you bought the colourful soufflé ramekins ? thanks . Hi, I tried making strawberry ice cream or froyo several times, but always found one problem I can’t solve using fresh berries. It always made my ice cream icy and flaky. Do you have any advise about that? None of the links address the issue specifically. What if you just chopped or prepared the fruit, then froze flat and transferred to a container or ice cream mixture. I’d think if it was already frozen it wouldn’t be able to cause ice crystals. I’m going to make this but would like to know what it’s supposed to yield. I know most homemade ice cream recipes are intended to yield about a quart but I wanted to check. Really I just replaced the icing ingredients and steps from the video with those in the other recipe. Hopefully Nami can do her magic as this Cheesecake Ice Cream has 583 calories a pint vs the 1040 in the B&J pint. B&J Red Velvet Cake Batter has 1000 calories and my recipe of those from above has 890 but I’d wager Nami could do better. 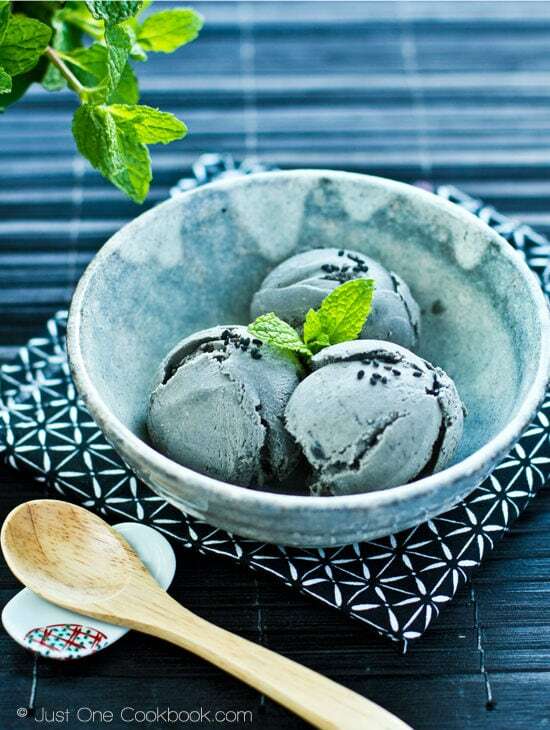 We made this ice cream last spring before we tried your green tea ice cream recipe and it is so good! Everyone who tried it really loved it.